We have Master Darren Tibon of Angel's Disciples and the USFMAF on the show. Master Tibon comes from a long line of martial artists. He began his martial arts study at the young age of seven, studying Goju-ryu karate. In 1981 he began his training in the legendary art of Grandmaster Angel Cabales, Serrada Escrima, from advanced students under GM Cabales. In 1987 he was privileged to study directly under GM Cabales further refining his knowledge and skill in Serrada Escrima. 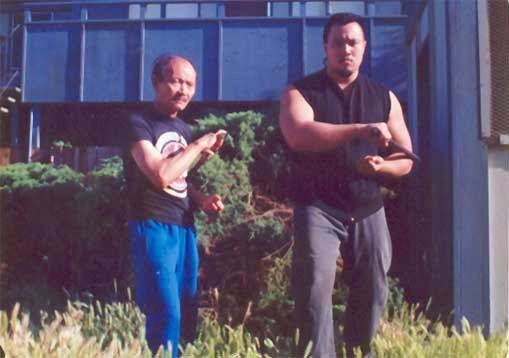 With GM Cabales death, in 1991, Master Tibon and his good friend Master Jerry Preciado founded the Angel's Disciples Escrima Association focused on retaining the principles bestowed upon GM Cabales' students as passed down to Master Tibon. Their association is also a powerhouse in the tournament scene, fielding many winning fighters throughout the California FMA tournament circuit. He also hosts and promotes the Stockton Legacy Seminar and Tournament series, a series dedicated to honoring the various Grandmasters of Stockton. The next Stockton Legacy Seminar and Tournament is coming up this April 5th.